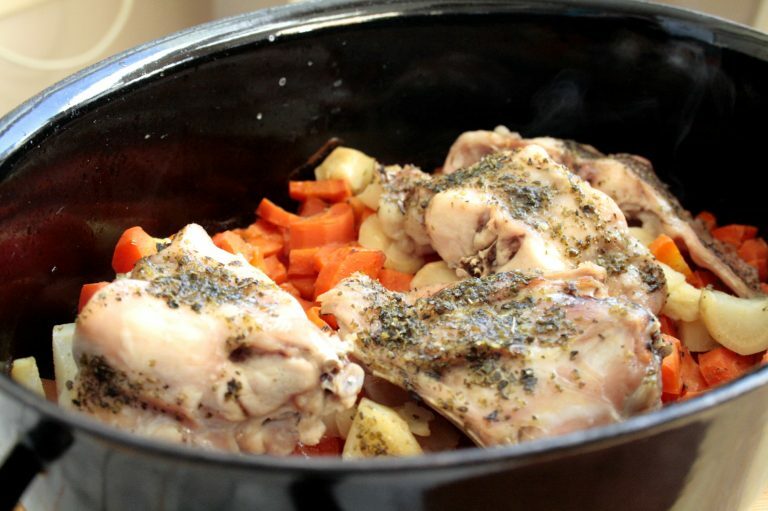 This Low FODMAP – One Dish Roasted Rabbit and Vegetables is so easy to make! The main work is to peel and chop the veggies, season and the oven will do the rest of work for you. I particularly like a rabbit meat, because it is very similar to a chicken but still quite lean. It doesn’t have this gamey flavour that many wild animal meats will have. To don’t overpower the flavour of a delicate meat, I just seasoned it with allspice and a marjoram. And of course some salt and pepper. Therefore there is only little washing up to do. First, divide the rabbit meat into four pieces. Then season the pieces with salt and pepper and sprinkle with allspice and generously with marjoram. You can keep it in spices before roasting or roast straightaway. In the meantime, peel carrots and parsnips. Chop them evenly. Using the sunflower oil, oil the roasting pot (the best to have one with a cover here) inside. Then place the carrots and parsnips inside and the pieces of rabbit on top. Preheat the oven to 180 degrees C. When ready, place the covered roasting pot inside the oven. Roast for about 45 minutes to an hour, but uncover for the last 15 minutes. Serve with mashed potatoes and a low FODMAP gravy. For other Low FODMAP dinner recipes, go here. "The good thing about thish dish is that is a one pot dish!" To don't overpower the flavour of delicate meat, I just seasoned it with allspice and a marjoram. And of course some salt and pepper. 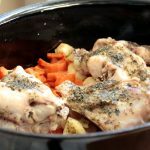 To find a Polish version of this recipe for a One Dish Roasted Rabbit and Vegetables (Low FODMAP Królik pieczony z warzywami), go here to my Przepisy Low FODMAP blog.